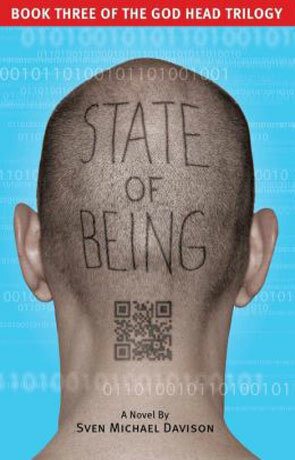 State of Being is the third novel in the God Head trilogy and follows directly on from the cataclysmic events in State of Union. Jake Travissi is on the run, having lost everything he cared for and the future looks bleak with AI taking over the surviving population; the only hope may mean going into outer space and beyond. One of the things I like the most about this series is the scale of the story, the author isn't afraid to make BIG changes, sacrifices and put the protagonist into seemingly impossible situations, this finale is no exception. When we begin this book the world unimaginably different than the one we inhabit right now and yet the steps to get to this post-apocalyptic stage have been not just feasible and justifiable but soberingly possible too. The author has a way of describing future tech in a very easy to understand manner, taking the current advances around right now on the next logical step in the journey of progress. Is it really likely to be that long before we have a chip in our heads? We are already living in a world where we can control artificial limbs with our brains, control parkinsons disease with a touch of a button or even move toy helicopters with our mind and wearable tech is already here (expect this to be big next year) with the imminent release of Google Glass, watches that link to your smartphone and countless other devices on the horizon. You can even get wearable tech for your pets too with a dog pendant that tracks physical activity and sleep patterns. When you see the technology we have right now, an integrated chip in the brain isn't all that far fetched (we already have implanted tech to control things like alzheimer's). More importantly neither is true Artificial Intelligence. News pieces are already popping up about the need for laws that govern such technology while others show off AI that can play games, read emails and pretend to be a real person in an online chat. Linking the artificial with the biological isn't a huge leap either, nor is the increased understanding of our brains, especially as the quest to build a brain in the lab is already under-way. The author does take the story much further than you would expect though and there are some truly surprising and unexpected directions travelled - it really does keep you on your toes. The story just doesn't let up either, there are very few quiet places in the book and the pace is relentless. The characters continue to grow and change as the novel progresses, especially are unlikely hero Jake who appears more and more human as the technology becomes more futuristic - there is still that sense of one man against the world too, struggling against seemingly insurmountable odds - a recalcitrance of the human spirit against the futility of inevitable change. The author also introduces some doubt over just what is real and what imagined, this is expertly done and really messes with your head, questioning the subject of reality (both subjective and absolute). Ultimately as with most science fiction the real story is about humanity, about how we cope with adversity, how we adapt to survive but also how we forge forward in the name of progress often without considering the medium or long term effects of such actions. It's also about the need for us to be happy, with ourselves and with our place in society, something that can only really be measured in an imperfect world. There are a lot of messages presented in State of Being and the God Head series, much that causes reflection and thought and plenty of material for some great discussions. The conclusion to the story is well placed, if a little unexpected and more positive than I would have expected given the destructive nature of the plot - a powerful novel in a first-rate series complete with a satisfying conclusion and plenty to think about. Written on 8th July 2013 by Ant.